So Magento 1.9 has been released, and followed up shortly by its version 1.9.0.1. 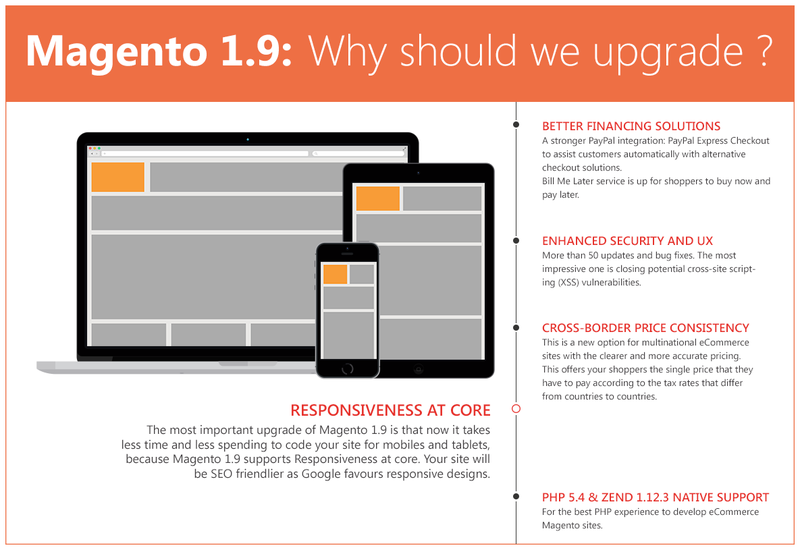 Wondering if it is a good move to upgrade your eCommerce Magento site to Magento 1.9? Here is the quick review highlighting a few of the good things we would get with Magento 1.9. Enjoy it and hopefully you can make up your mind! You can head over the Magento 1.9 release note for more details, or just enjoy our summary of the key improvements only. The most important upgrade of Magento 1.9 is that now it takes less time and less spending to code your site for mobiles and tablets, because Magento 1.9 supports Responsiveness at core. Your site will be SEO friendlier as Google favours responsive designs. A stronger PayPal integration: PayPal Express Checkout to assist customers automatically with alternative checkout solutions. Also the Bill Me Later service is up for shoppers to buy now and pay later. Sweatless checkout process encourages more pleasing experience for customers. More than 50 updates and bug fixes. The most impressive one is closing potential cross-site scripting (XSS) vulnerabilities. This is a new option for multinational eCommerce sites with the clearer and more accurate pricing. This offers your shoppers the single price that they have to pay according to the tax rates that differ from countries to countries. For the best PHP experience while developing eCommerce Magento sites. Accordingly, if you want to make your site ready for the fast-growing market mobile commerce, don't miss the chance with Magento 1.9. And keep it in mind that our very first responsive Magento 1.9 theme JM Summer is soon to release!